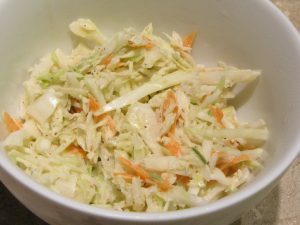 Most of the time I make coleslaw it’s for large family get-togethers, like a barbecue or picnic. Sometimes, though, I just want to make a small batch to go with fish tacos or to serve on a pulled pork sandwich. This tangy coleslaw for two is a recipe for a smaller batch that could work as a side dish or as a condiment. We grew cabbage in the garden this year instead of Brussels sprouts so we’ve been eating more of it than we normally do. When you’ve got a row of cabbage this beautiful, you’ve got to be creative. Cabbage is one of my favorite vegetables but when you can get it fresh – from your garden or farmers market, the flavor is so much better. 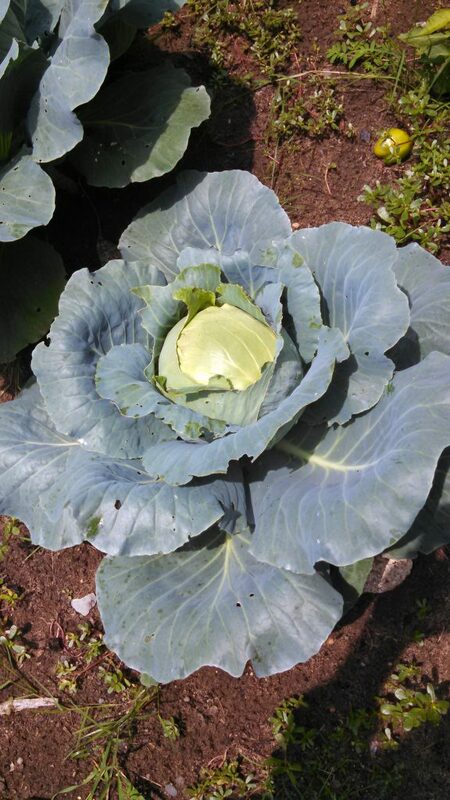 Another thing I like about cabbage is that after we harvest the main head, it keeps growing. The subsequent heads are smaller and just as delicious. Cole slaw or coleslaw is simply a cabbage salad. So you can go crazy and make your cabbage salad however you want. Use your imagination or give this one a try. A recipe for a tangy coleslaw that is perfect for two or to put on sandwiches or fish tacos. In a medium sized bowl combine the celery salt, black pepper, mayonnaise, apple cider vinegar and sugar. Mix well. Add the cabbage and carrot. Stir to combine. Taste and adjust seasonings to your preference. Below are some tools that you might find helpful for making fresh slaw. I have all of these items. I love my knife and the box grater. My food processor is older (wedding gift I got in 1987!) and my mandolin slicer is from Pampered Chef. The key to a good slaw is to make sure that everything is uniformly chopped. That’s why it might be a good idea to use the grater, food processor or mandolin if you’re making a big batch. To be completely transparent, I should let you know that if you click – and purchase – any of these items using one of these links, I will receive a small commission. Be sure to let me know your favorite slaw combination in the comments below!